Today a funny thing happened to me while carving some small letters. James had the vacuum cleaner going fairly close by (no more sweeping for us) and I couldn’t hear the slate gently clinking and clanking as I cut. I tried to blank it out, knowing that it would soon end. 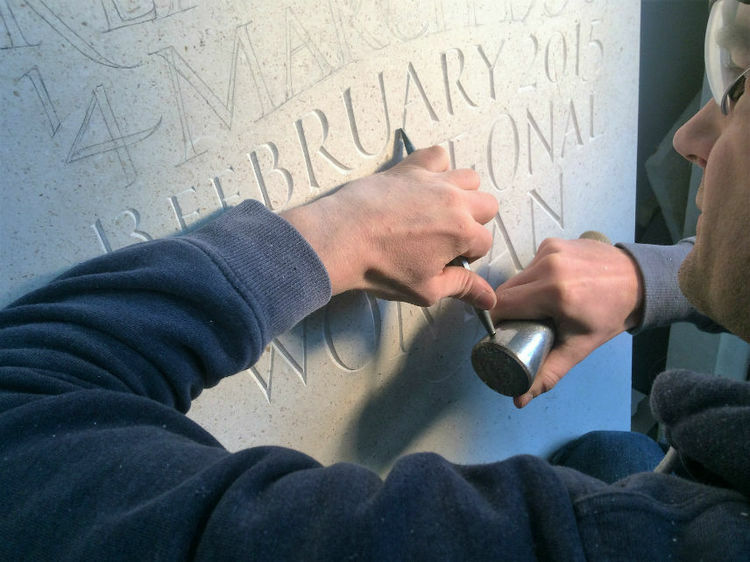 The problem was, my letters were beginning to look ropey and clumsy and the edges a bit chipped. I quickly realised that because I couldn’t hear, my hands were being clumsy and I was losing accuracy. The clinking of the slate I have discovered acts as a guide to the cutter. Very quickly the mind tunes into the music of the blows. Later on, after James had disappeared for the day, I shoved some headphones on and experimented; the same thing happened. Tomorrow, maybe I shall put a peg on my nose and see how useful my sense of smell can be to improving my carving. To be able to smell while carving is I suspect a pleasure, but not a requirement. Nothing pleases the sinuses more than a fresh cut into a lump of Portland limestone, and the ancient, bitumous fragrance of fossil being released. Returning to my musings on the hoover, it might well have been partly due to a simple matter of loss of concentration; the noise of the industrial vacuum, creating a slightly stressful environment. Whatever the reason, the whole episode was a reminder of the importance of the senses, and how we need them to create an environment of intimacy in which to work well. Health and safety these days requires one to wear protective barriers which, unfortunately, hinder the craftsman considerably. 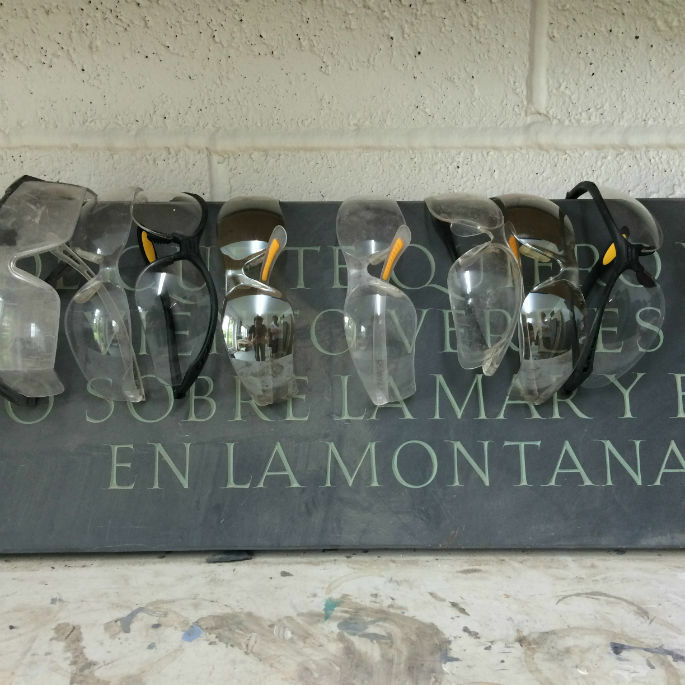 Imagine wearing heavy ear-defenders, dusty and scratched safety glasses, sweaty dust mask, rubber gloves, and then cutting a delicate 15mm high letter in unforgiving slate! Near impossible. Having said this, and before I get into trouble, it is probably worth wearing some sort of a mask, especially when carving slate (take the peg off first). Glasses are often a good idea too if they are glass, not plastic and lightweight. It took me a good few years before I realised that they do actually work. We used to have a mirror hanging in the workshop to assist carvers with the removal of chunks of stone from the eyeball. Indeed, I met a carver years ago while training, who was able to convince me that he could blink just after each mallet strike, thus dodging the flying debris.